This is part two of a five-part series introducing the creative process for data-driven campaigns as outlined in our new guide: The Creative Process for Programmatic: A Guide for Marketers. Anyone who’s managed an ad campaign knows that there are two kinds of success. The first is executional: hitting KPI’s. But there’s a second metric that can be just as important, and may even influence your numbers: how everyone feels when the campaign is over. Is the team bursting with new learnings and toasting a job well done, or reaching for the Advil while muttering: “never again”? To help ensure that your campaigns run smoothly from start to finish and end in beers instead of tears, we recommend incorporating a single, crucial step into your process: the all-hands-on-deck collaborative brief. We recently tested several methodologies for executing data-driven creative campaigns, which we explore in detail in The Creative Process for Programmatic: A Guide for Marketers. We universally found that including a collaborative digital brief-building session can lead to more positive results, setting the stage for a campaign that runs smoothly from start to finish. You’ve probably had an all-hands kick-off before: one in which you gathered all of your agencies and gave them their marching orders. This is different. Instead of briefing your media, creative, and production agencies, you’re soliciting their expertise. This briefing process may seem more open-ended, collaborative, and cyclical than the process you’re used to. Consider that involving your agencies in developing a collective digital brief changes the approach from: “here’s what I want you to do” to “here’s what I’m thinking, what are your thoughts?” It enables you to take advantage of the knowledge on your team and creates a stronger sense of investment from everyone involved. Meet in person if possible and use this time to review project goals and start building the digital brief. We also encourage extensive whiteboard usage. Writing down all the data signals you gathered in Phase 1 can help everyone visualize the campaign map and generate ideas together. When we worked with Royal Bank of Canada on their campaign for a premium credit card, the team successfully used the collaborative briefing meeting to bring together marketing, media buying, creative and data analysts. 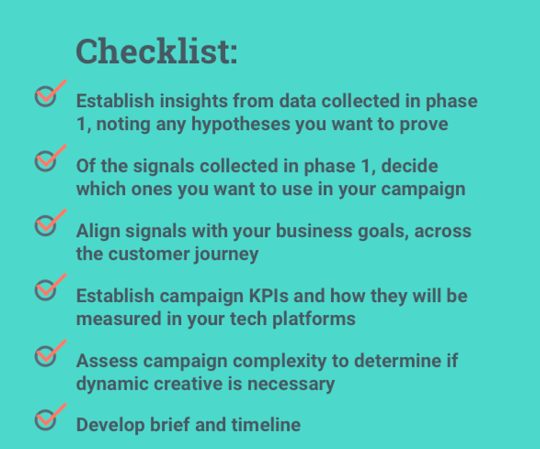 As a group, we discussed the brand’s overall goals for the campaign, the target audience, and the data signals that could be used to reach that audience. We also decided on the creative strategy that would be used for the campaign. Check out phase two of “The Creative Process for programmatic: A guide for marketers” to learn more about RBC’s approach and how you can follow suit. We’re also hosting a hangout on air on Tuesday, April 5th at 12pm ET, to discuss the research and provide some key takeaways from the guide. RSVP here.